Dunk Tanks have long been a carnival classic -- and with good reason. Children and adults alike love the opportunity to soak their friends, teachers, parents, and bosses all in the name of good-natured fun. Players toss balls (included with rental) at the colorful target and are rewarded with a splash when they hit the bullseye! Catch that look of surprise on the dunkee's face as they fall into the pool of water below the bench they are perched on! But don't worry about grudges -- on a hot Houston day, these "victims" will be cheering players on in hopes of getting some watery relief from the heat. 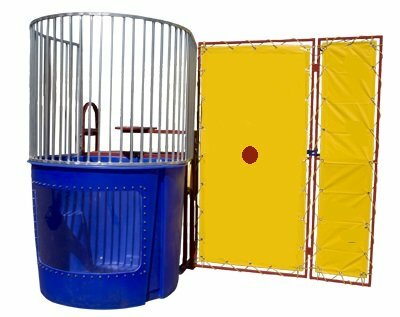 Dunking booth rentals are safe and fun for all participants and extremely popular for school functions and fundraisers. Make a splash at your next gathering with this crowd favorite! You must supply a water source to the dunk tank.